When you encounter a program that claims it has generated over $10M in just 2 years using a secret system specifically created to take advantage of a loophole on the web, it will surely get your attention and you would like to know the truth about it. 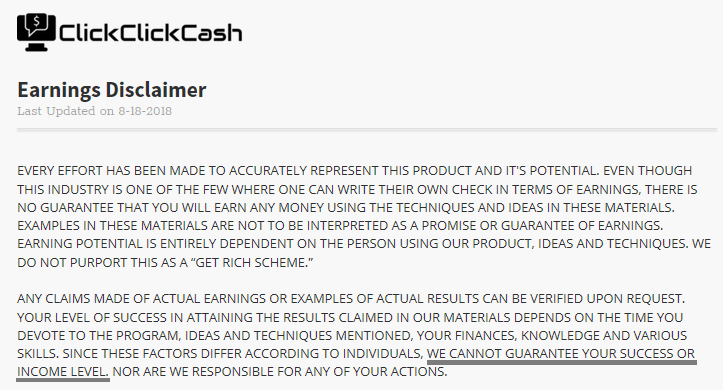 I’m sure this is the main reason why you’ve found my Click Click Cash review because you want to know if this program is the real deal or another scam on the internet that you need to stay away from. Before you make your final decision, let me share with your first some of the info and red flags I have uncovered from this program. So, is Click Click Cash a scam or is it a legit opportunity that you can rely on? You will soon be able to answer this question yourself after you’ve read this review. Click Click Cash is a program that promises people an opportunity to make $2m in just 24 months with minimal effort. It is created by a so-called Josh who also claims that he discovered this secret system that provided him 8-figure earnings. Based on my own experience, it is possible to create a decent income online but you’ll need to invest time, effort and a bit of patience to succeed. You cannot make a ton of money with minimal effort or relying only on automated systems. That’s why these claims, in my opinion, is unrealistic and too good to be true and it’s better to search for other legit alternatives that can truly provide you the outcome that you’re looking for. What is Click Click Cash and what does it offer? When I first visited their sales page, I must admit I was skeptical. Especially when I saw the claim that its creator had amassed over $10M in just 2 years using a secret system he called Click Click Cash. Josh claims that he made over $10m in just 2 years using this system. Its creator, known only as Josh, will reveal to you a simple formula that will supposedly help you earn 8 figures in just 24 months. He also claims that his system revolves around his pre-existing websites that are now generating a ton of money online and you will take advantage of these sites so you can also make 8-figure earnings. The only thing you need to do is to buy their program for $37 and follow the simple steps and instructions that he will provide you. According to Josh, this system is so simple to use, you don’t need any prior experience in online marketing to succeed. After the initial claims, you will see several testimonials from so-called successful members or clients that made a lot of money using this program. He also says that he hates scammers and this program will be different because it will truly deliver the results that people are looking for. The moment I saw their website and the claims that it’s the perfect solution to anyone who wants to make money online, I became more skeptical. Honestly, some people do make this kind of money online, but it can’t be that simple and it’s not possible to achieve it overnight. In fact, there is NO automatic system that can give you this kind of money without investing much time and effort in learning the proper ways of making money online. But I won’t make assumptions without doing proper research about this program, so I did an in-depth investigation and found several discrepancies and red flags that I will share with you. Hopefully, it can help you make an informed decision about this program and determine if it’s really for you or not. Red flag #1 – How does their secret system work? When you watch the sales video, you’ll be amazed by how Josh explains the features and benefits you can get from his program. In fact, it would only take you a few minutes to set up everything and the money flows directly into your account. He is not interested in revealing how his system works. 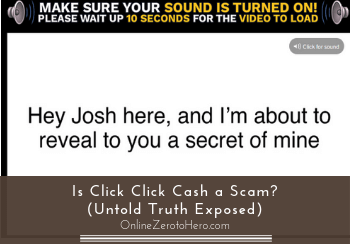 However, you’ll never know how this secret system really works, because Josh is NOT interested to reveal to you the whole process. I know it’s exciting to see all those income proofs, but we need to know how this system really works. You’ll want to know the inner workings of this system and how it generates the income it claims it can provide. In my opinion and experience, making money online is not a complicated process. You can definitely learn the ways and methods of creating a decent income online. But it can’t be achieved without proper training. You’ll need to invest your time, effort, and a bit of patience to succeed. That’s why I would consider this as a significant red flag because they are not transparent enough to share to you the whole process. Or at least a part of it so you will have an idea about how you will be making money. I hope you will take this red flag into consideration before you decide to purchase this program. Warning Sign #2 – Who exactly is Josh? Based on their sales video, the owner and creator of this program is Josh but that’s the only information we have of him from their site. There is no reference of Josh anywhere on their sales page. There’s no reference of him anywhere on their sales page, so we’ll never know who Josh really is or if he is even a real person. This is one of the biggest dilemmas I see with this program because they are not transparent when it comes to the real owner of this program. Again, this is another transparency issue and it’s literally damaging the confidence and trust of people towards this program. In my opinion, if you’re the creator of a great program that can really help people make money online then why would you hide your true identity. It’s important for people to know your contact details, so they can get in touch with you and provide their feedback towards the program. This is also another way of getting genuine testimonials from real customers because they are confident that they know who they are dealing with. However, this is not the case with Click Click Cash since you don’t know who the true owner of this program really is. I hope you’ll take this red flag seriously before you make your final decision. Another red flag I found on their sales page is the many instances they use fake scarcity tactic. It is clear that they are encouraging people to act quickly and resort to impulse buying so they can make their product saleable. They are using fake scarcity tactics to entice you to buy their product. I know this is a valid tactic to entice people into buying a product by giving them a reason to act quickly, but when you give people the impression that somebody else will steal their opportunity to make a lot of money online because of inaction, is for me, a bit too much. In fact, Josh even says on their video that they will close down their program after midnight and you’ll need to hurry up because it won’t be available the next morning. But in reality, if you visit their sales page the next day you will still see that it’s still there. In my opinion, I cannot trust a program that employs fake scarcity, since it gives you the impression that they are NOT confident about their product. This also means you cannot expect them to help you achieve the results that you are aiming to get. If you have watched their sales video, you will see several testimonials of their so-called successful clients. Each one of them has their own income claim that this is the one program that can help you make a ton of money online. However, when I did a thorough investigation of the people behind these testimonials, I found out that these individuals are freelancers from Fiver, who are paid to do these testimonials. This freelancer from Fiverr also appeared in Wiseball Secret Society. This means these are all fake testimonials from freelancers and NOT from actual customers. I have several proofs that will show you their profiles from Fiverr. 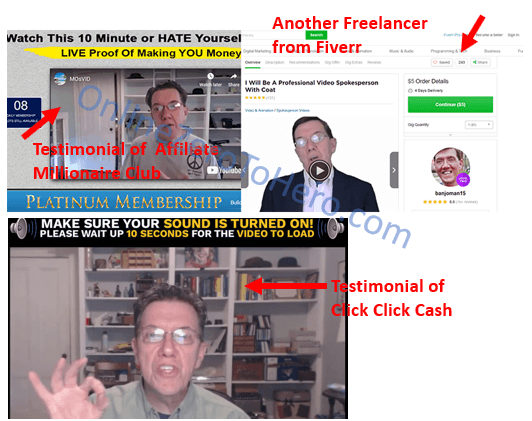 This freelancer also appeared in Affiliate Millionaire Club. Also, some of them have already appeared in other programs like Wiseball Secret Society and Affiliate Millionaire Club which I have reviewed in the past. For me, this is a clear indication that they are NOT truthful about their program and they are willing to use what in my opinion is unethical means to lure people into buying their product. This is a significant red flag that you need to be aware and I hope you take this into consideration before you make your decision. I would also like to point out an issue I found on their earnings disclaimer. Their statement there clearly says they cannot guarantee your success. They cannot guarantee your success. This is very different from what they are saying on their sales video, which means there’s a big discrepancy from what they are advertising on their sales page as opposed to what the real requirements of making money online really are. In my experience as an affiliate marketer, there are NO shortcuts or automated systems that help you create a passive income online without putting any work into it. You’ll need to invest your time to learn more about the proper ways of making money online and to execute what you have learned in the most ethical and legal way possible. This way you will truly reap the rewards in the long run, by creating a decent income online. I think it is time to answer the million-dollar question that is running on your mind. I have given you all the information and red flags that I have uncovered from their sales page, so I’m sure that you can now make an informed decision about this program. However, your answer will depend on a lot of your expectations, your previous skills, and your budget. To help you more in your decision-making process, here is an overview of the things I’ve tackled in this review. Overall, I don’t recommend this program simply because of the many red flags I’ve uncovered from their site, which also makes it a risky investment in my opinion. I suggest that you look for a better opportunity on the web that can truly give you the best chances of making money online. If you are interested in finding a better alternative that helps you create a decent income online, then I urge you to check out my FREE guide about making money online where I will share all the proper steps that can point you in the right direction. My guide will even show you how you can start your journey online completely for FREE. If you have any comments, questions, or have any experiences with Click Click Cash, I would love to hear from you in a comment below.